Enviro-Gods: Eelio - Website of shawnsheehy! Nearly all of my pop-up books consider organisms and ecosystems in order to address issues regarding system balance, sustainability, and ecological and cultural evolution. In this ongoing project I foreground cultural evolution in the form of human religious practice. Eelio is the second god in this series. Just as past gods were constructed to explain the unexplainable or provide a focal point for mercy pleas, the Indicator Species creatures are a contemporary invention contrived to address contemporary concerns. Neil Gaiman’s novel American Gods provided inspiration. 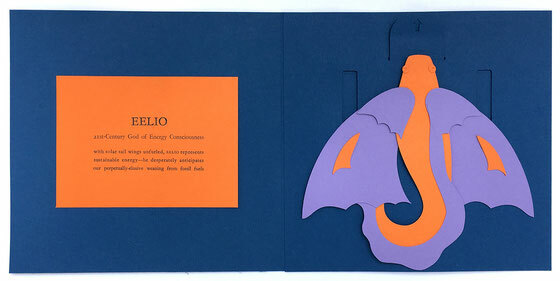 The name "Eelio" is derived from the words "Helios" and "eel." Helios is the Greek god of the sun—a primary energy source. Electric eels are a fitting manifestation for an energy god as they generate their own electricity. 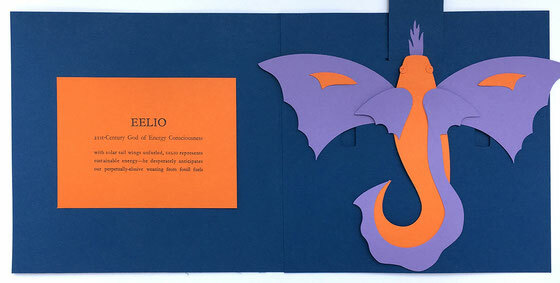 Eelio's wings are solar sails and he exhales a cool flame.